Salad Days: tortilla soup aka reverse nachos! tortilla soup aka reverse nachos! This literally took me under half an hour and did the trick in satisfying my craving for corn chip heavy/nutrition light nachos by replacing it with this nutrition heavy/corn chip light (but more than enough to fulfil the enduring need) stewy soup. The recipe was quite heavily based on Isa's (wonderful, amazing, brilliant) newish cookbook 'Appetite for Reduction' which I am steadily making my way through. The biggest change I made was adding in a cup or so of cooked quinoa in order to amp up the protein a little in addition to providing a broader spectrum of essential (and nonessential!) amino acids when combined with the beans and corn. I also chucked in my everlasting love, avocado, because it's such a wonderful way to ingest good fats. Preheat your oil for a tad, and add your onion and jalapeno pepper and capsicums. Sautee until onions become translucent and soft, which took about 3-4 minutes. Next add the garlic and salt, and continue to sautee. Empty the can of tomatoes into the pot and stab repeatedly with your stirring implement, breaking it up some, and add the vegetable broth. Mix in the cumin and a handful of crumbled corn chips (yes! Into the wet mix!). Cover and bring to the boil, once it has been brought to said boil - add the beans, quinoa and corn and reduce heat, allowing to simmer for about 5 minutes (or as long as you can possibly wait). Plate (bowl?) 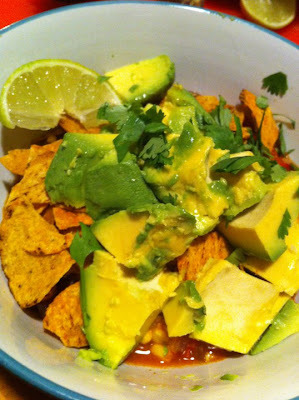 up and cover with more crumpled corn chips, a half avocado or so per person, coriander and a wedge of lime for squirting. Apologies for crappy iPhone photo. I'm getting my blogging act together one step at a time, you see.